This is wonderful! Fans of Ikea furniture will know they also make fabrics, and are a Swedish company. I had this great Ikea fabric that seemed perfect for a Tilly shoulder bag. Gunnel, who lives in Sweden, bought the bag. So my bag, made with Swedish Ikea fabric, has a new home in Sweden. The lovely Gunnel was kind enough to send me this fantastic photograph of herself and her new bag. I am so happy! Thank you Gunnel. The Scribe is my pen and pencil case. A simple zippered bag that is quite popular. It can be used for many other things besides pencils. Its long, slim shape can accommodate all kinds of things that you might need to carry in your purse! The variety of prints I use means they are a great gift idea too. How about a peace sign Kindle case? Designed to allow you to add straps in order to customize how you want to carry the case. You can buy it as it and put it in a larger bag, or lay it on a table, or you can purchase additional straps that turn it into a wristlet or a shoulder bag. You can add the additional straps right in the listing for the bag, as you check out, making a one stop shopping trip! Looking for something retro and quirky? Can't go wrong with Dysfunctional family! Pretty? How about stained glass poppies? Then contact me to place a custom order. I make custom cases every week! What a beautiful custom ordered bag this was. It's a Panther Deluxe made with the Heron Garden print. This is the largest messenger bag I make and many people order them to use as diaper bags, or school bags. Find in stock Panther Deluxe Messenger Bags in the shop here. Want a custom order? Contact me to work out the details! "Even though it's been a while, you still get me with such great designs and fabric. I use my other gems a lot and love them all. I never ever tire of the things you make. Gorgeous Day of the Dead fabric for your dream bag! Just in, a beautiful new Day of the Dead fabric called Jardin de Los Meurtos. Day of the Dead bags continue to be one of my best sellers, especially Day of the Dead diaper bags. I ship them all over the world! Contact me if you must have something made from this beauty. I just shared it on Facebook and already have a taker! Horses, drawstring bags, and you! This is a Suebee drawstring bag. These simple bags are very popular with my customers. They use them for everything from knitting bags to storage in the bathroom, carrying golf balls and going out for the evening! They are perfect gifts, and work great as reusable wrapping too! Of course, if you would like something custom made with a horse fabric, I am happy to do that. Contact me anytime! I love this fabric! Our first dog was a border collie mix. He was the animal that made us so crazy about dogs. This fabric has a great selection of border collie faces on it, and makes the best bags for border collie lovers. If you would like to have a border collie purse, messenger bag, case for your Kindle, or iPad, this is the place to get it. Contact me for a custom order, as my regular customers will tell you, custom orders are my specialty! Custom bag and customer service feedback! I am delighted to share with you an awesome photograph of one of my customers, and her kind words about the bag I made for her. 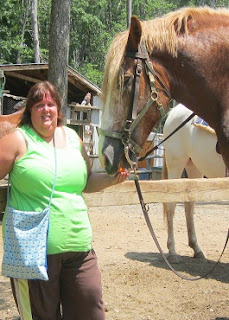 Below is a picture of me and Big John, one of the trail horses I ride, and my lovely new bag. While I treasure the bag for its beauty, quality and serious bang-for-your-buck, the experience working with you was equally delightful. You turned the process of getting a custom bag into a collaborative creative adventure. I'd say "Could the bag have interior pockets?" You'd say "Sure! how big?" I'd say, "Could it be similar to a bag I already have?" You'd say, "Sure! Just send me pictures of your old bag with measurements." I am now forever spoiled by your "Sure!" Thank you so very much for such a delightful bag. I am officially back to work today, after a wonderful, and lengthy, break for Christmas and New Years. 2011 proved to be my best year yet. Thanks to all my fantastic customers. Many are new, and are taking a chance on buying from some woman in Colorado who makes nice bags, LOL! But to those who return to buy over and over again through the years I have sold my bags on line, it's because of you that I am successful. Your trust in me mean so much. I am humbled by the kind comments I receive, not only about the quality of my products, but the customer service I provide as well. Those comments, and the photographs you send, help new customers feel comfortable buying my bags, and asking for a custom order. I can't tell you how many people comment on how helpful the photographs are, as they try to decide which bag to order. So thanks to you all, and here's to an amazing 2012 for all of us!